Your registration is free and includes two drink tickets. Registration is limited to current LGAA members, and is limited to 30 people – first come, first served. We hope to see you there! Your registration is free and includes two drink tickets. Registration is limited to current paid LGAA members, and is limited to 30 people – first come, first served. We hope to see you there! 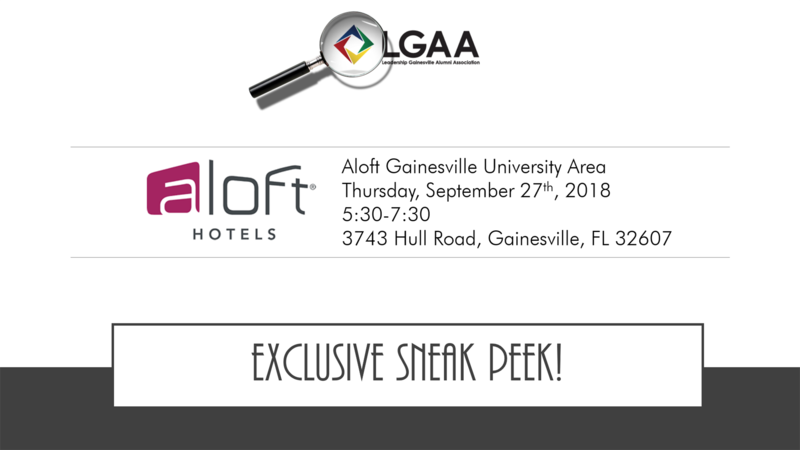 Please join us for LGAA’s very first Exclusive Sneak Peek Event to tour Aloft Gainesville University Area Hotel on Thursday, September 27th from 5:30-7:30! Join your fellow LGAA members for networking, drinks and an exclusive first look at the brand new Aloft Hotel! Your registration is free, and includes two drink tickets. Registration is limited to current paid LGAA members, and is limited to 30 people – first come, first served. We hope to see you there!